To practice and perform effectively we have to be able to see through our own eyes when our bow is parallel to the bridge. This is not an easy task, everyone’s eyes are different and we need to find our own way. At the same time, we need all of the help we can get. Mirrors and double mirrors are distracting as we have to turn our head to use them. Video is excellent feedback but is not always accessible. Here is a highly mobile tool, on your instrument. It may help, particularly if you have a teacher or someone to give you feedback as you learn to use it. You will need some ordinary white or light coloured chalk. Apply the chalk to the end of your fingerboard.Don’t worry, it will rub off when you don’t need it and is almost invisible to anyone else. The bow on the left is crooked, not straight as we say, not parallel to the bridge. The bow on the right is parallel to the bridge and the hair forms a perfect + with the string. 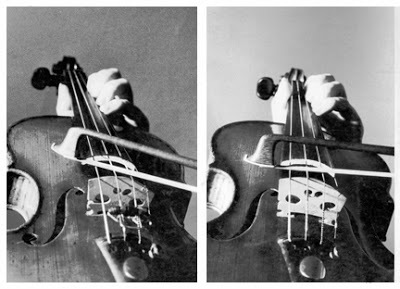 If you were to seesaw the bow on the right between the lower and upper strings, you would see that it would remain equidistant from the bridge on all strings. As you look closely at the pictures, you will see a dark crescent shaped shadow between bow hair and the chalk marked edge of the fingerboard. This crescent shape can also be used as a frame of reference as you gaze through the bow hair and stick when you are playing. After you have mastered how a parallel bow looks on the D string you will want to transfer that knowledge to your other strings. The angles will be similar but not exactly the same. Your final step will be to use these methods of seeing as you are playing, initially with another person or video present to give you feedback as to what is straight and whether this method is working for you. Good luck. We wish. The amount that we practice is not the most important factor. It is how and what we practice that predicts our future performance. We have the violin on our shoulder, hopefully it feels good today. We pick up the bow. For a beautiful clear tone we need to move the bow so that it travels parallel to the bridge. However, when we start at the frog of the bow, unfortunately our arm will tend to naturally move in an arc towards the tip … not in a straight line. What if we reverse directions and we practice starting at the other end of the bow? Will it be easier to move from tip to frog in a straighter line and then, perhaps return by the same path to the tip? 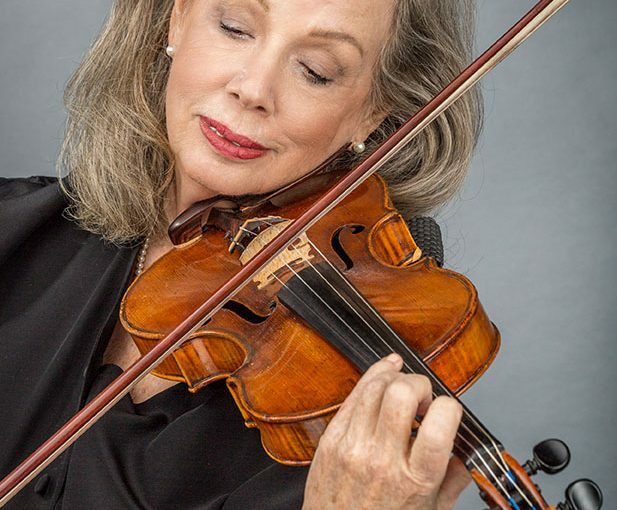 Try it, start at the tip – parallel to the bridge -play to the frog,watching closely that the hair of the bow maintains the same angle with the string throughout. The professional usually starts by tuning their violin quietly at the tip. That is how they can both hear themselves tune in a group and also update their ‘feel’ of their extended arm connecting to the violin at the point of the bow. Be like the Pro. Begin by finding where the tip of your bow really is instead of just careening down the string from the frog to tip, not knowing where you will land and hoping for the best.